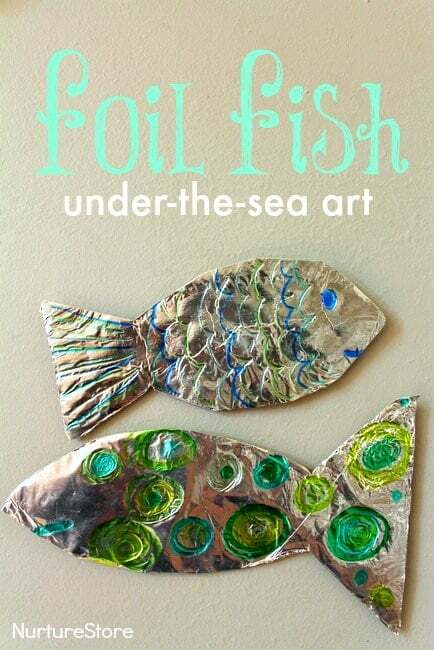 This foil fish craft is great as part of an ‘under the sea’ theme or as seaside art. The foil presents children with an interesting material to paint on and you can make a whole ocean full of their designs. And don’t miss my free fish-themed printables! Hey, are you doing a project on fish, the seaside or the ocean? 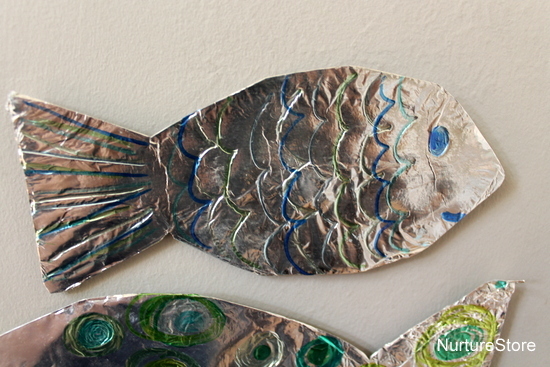 If you’re looking at this foil fish craft then I guess you might be. I have some great free printables on a fish theme that I think you’ll love. NurtureStore has an extensive library of free printables, including a free Number Fish printable, which is great for adding numbers to your play and working on math skills in a hands-on way. I also have a lovely free Ocean Creatures Play Set which you can print and combine with playdough or a water tub for imaginary play. Would you like copies of these free ocean printables to complement your foil fish craft? Pop your email address in the box below and I’ll send them to you. You’re welcome! Get ALL my free printables by joining the NurtureStore community and gaining instant access to my free resource library, which includes these printables. 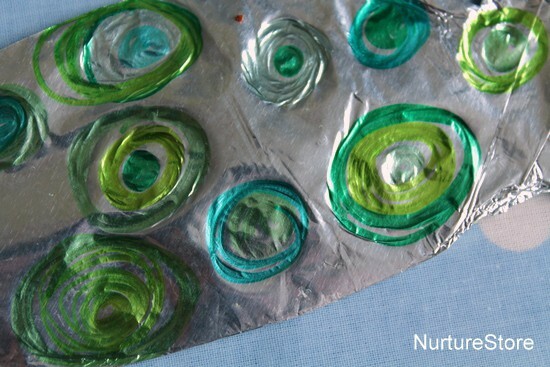 To make these fish you’ll need: some card, foil, markers, oil pastels or acrylic paints. 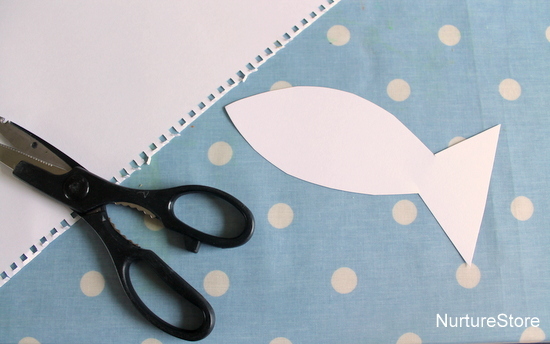 Begin by drawing a fish shape on a piece of card and cutting it out. You can look in an ocean information book to discover all the different shapes that fish can be and pick your favourite. You could make a shoal of fish, all the same shape but with each child adding their unique design, or invite everyone to make something different. Then wrap your fish in foil – we used kitchen foil wrap, nothing fancy! 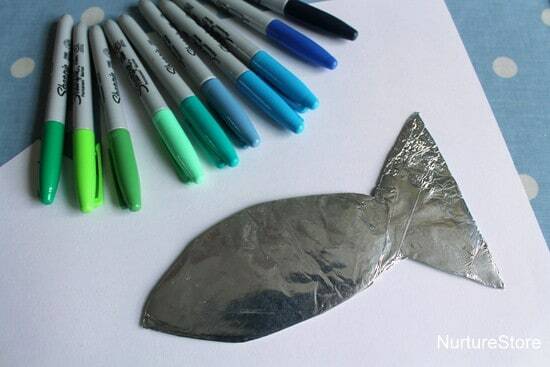 You can tear the foil a little, and fold and scrunch it, to get it to fit your fish shape. 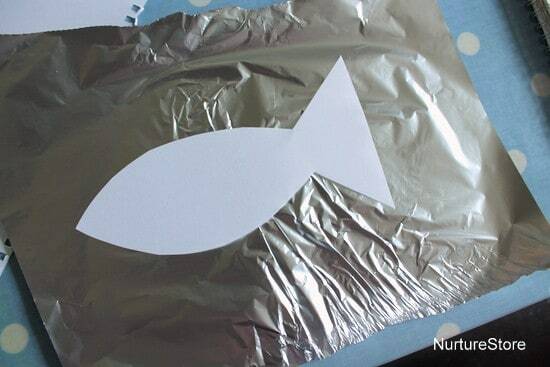 Once your fish is covered in the foil it’s then time to add your design. You can use acrylic paint, oil pastel crayons or permanent markers. You can make any design you like. You might choose recreate the patterns of a real fish, or create one from your imagination. Swirls, stripes, scales – anything goes. If you want to hang your fish as a mobile, apply a design to both sides. The fished fish look great hung from a piece of twine in front of a window, where they can twirl in the breeze and reflect the sunlight. For more ocean themed ideas you might like our fish tank craft, shell mobile, sandcastle messy play, printable sea creatures or our shell sight words. 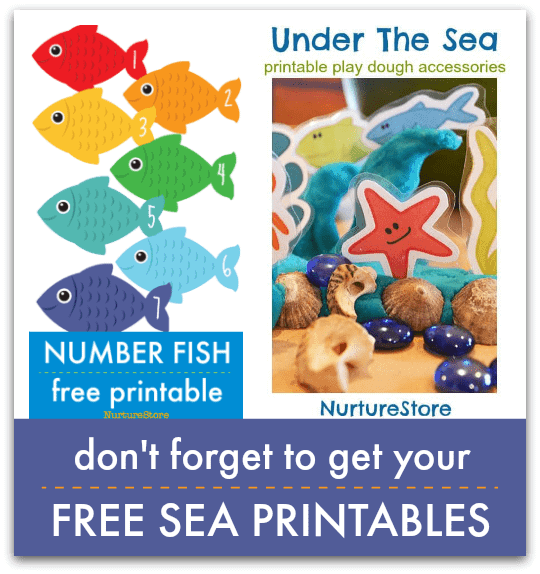 Don’t forget to get the free Number Fish and Ocean Creatures Play Set printables while you’re here! This looks like a great project for our little guy. Hope you have fun with it Carol! I’m going to try this tomorrow with the kids I babysit. The girl is four years and the boy is eight. I think both of them will really enjoy this. Thank you for the great (and simple!) idea. 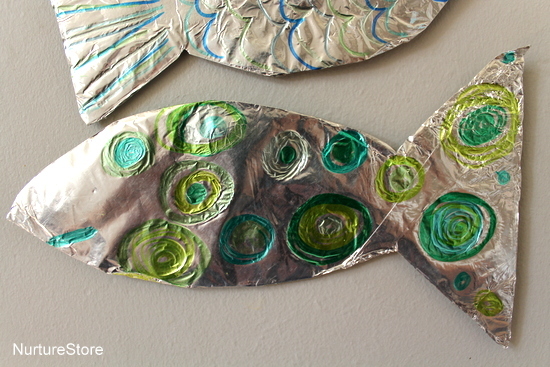 I was looking for a craft involving fish and I found your activity.I have never worked on foil before and couldn’t wait to try it with my four year old Jaybird. I didn’t let him use my Sharpies because he makes a mess when he uses markers, so I did that part but let him paint over everything. He loved it. We’ll do it again sometime. They turned out beautiful. That’s so great to hear Sue. The foil is really interesting to work on, isn’t it. Happy you had fun with the idea! I used this idea earlier in the week and this is wonderful. We had googly eyes even made foil jellyfish haha . This is so great! It has inspired me to make our own foil butterflies.